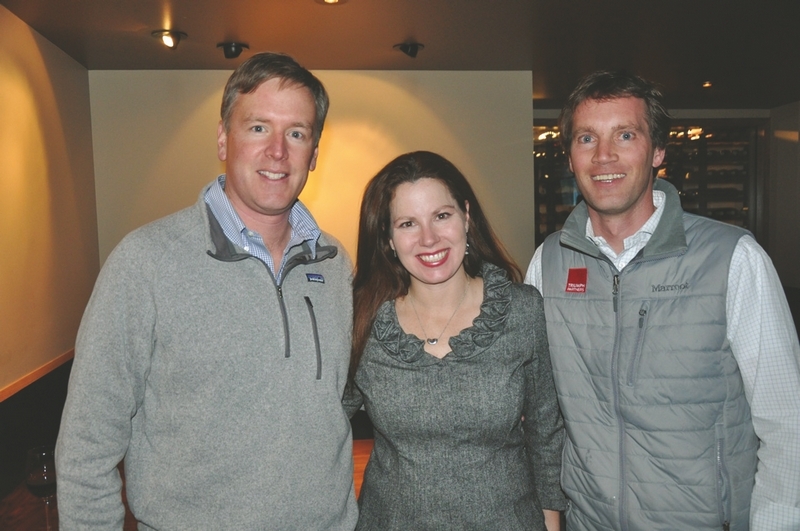 Triumph Partners' Michael O'Connor and Travis Coggin celebrate AlpenGLOW's opening with the Town of Vail's Art in Public Places Coordinator Molly Eppard. New restaurant Mountain Standard hosted a group of supporters of the town of Vail’s Arts in Public Places program on Friday evening. Artists/sculptors, town of Vail officials, longtime locals, and fresh new faces (including successful, yet down-to-earth Australian actor Nathaniel Buzolic) came together to celebrate. Guests mingled with restaurant owner Matt Morgan and his talented crew before stepping out and taking in the impressive and dramatic ice sculpture art display. Meandering along the Gore Creek Promenade is a magical experience any time but add the glowing illumination of ice sculpture and it is downright mystical. Thanks to the handiwork and hard work of Paul Wertin and Kent Roberg of Alpine Ice and Nathan Cox of Pink Monkey Solutions there is a spectacle to behold along the babbling Gore Creek. As part of the town of Vail’s Art in Public Places, the sixth annual Triumph Winterfest exhibition celebrates all things Vail and mountain culture through interactive and visual arts. Town of Vail Arts in Public Places Coordinator Molly Eppard spoke to the crowd gathered outside in the Logan Ice Theater. Eppard also thanked the Logans for their dedication to the arts and her co-workers at the town of Vail and the AIPP board of directors. Eppard was then treated to a loud congratulatory round of applause from her peers for her commitment to art and contribution to the community. To learn more, visit http://www.artinvail.com. Social columnist Betty Ann Woodland covers soirees, events and fundraisers for non-profits. She can be contacted at highaltitudesociety@vaildaily.com.